Ravi Shankar’s ‘Sukanya’ Finale: “A feast for the eyes and ears”! The Royal Festival Hall was bustling with excitement at London’s premiere of Ravi Shankar’s much-anticipated opera Sukanya, on 19th May 2017. This wonderful performance was the finale of the world’s premiere tour of Shankar’s only opera, directed by Suba Das, Associate Director of Curve, Theatre Leicester. This unique tour was co-produced by The Royal Opera, the London Philharmonic Orchestra and Curve and supported by the Bagri Foundation and Arts Council England. Musicians, singers and dancers came together onstage to celebrate Ravi Shankar’s imaginative vision. The performance indeed reflected Shankar’s multifaceted musical journey. Shankar was famously experimental with many western genres, including jazz and 1960s pop, to name a few, and the performance combined Indian and Western instrumentation and scales. Conducted by David Murphy, a long-time collaborator of Ravi Shankar, Sukanya resounded with all the instruments of an orchestra (by the London Philharmonic Orchestra), as well as the sitar, mridangam, tabla and shehnai, of Indian music. The exquisite combinations of certain instruments, such as a solo bassoon with the sitar, were, surely, novel to the ears of most and incredibly invigorating. 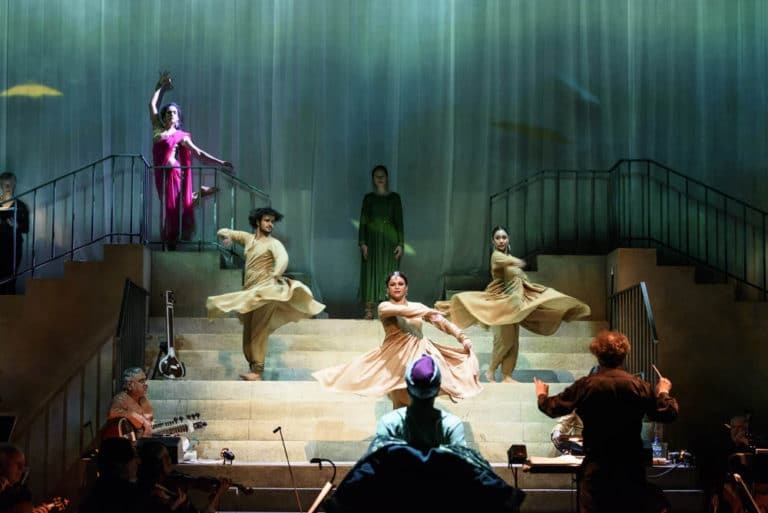 Embracing Indian and Western singing, opera singers Susanna Hurrell and Alok Kumar actualised the love story of Sukanya and Chyavana, beautifully re-visited from the Mahabharata by librettist Amit Chaudhuri. The audience was transported by the melodic phrases of the operatic chorus (BBC singers) and the syllabic vocal percussion of Carnatic music (Konnakol) whose rhythmic phrases were passed back and forth in call and response, one in a passionate and expressive multi-pitched style, and the other in a warm-toned and resonant single pitch. Alongside this rich canopy of sound, the production was a visual feast. The artistry of 59 Productions, the design company in charge of the set design, was revealed. Inventive video projections on the backdrop brought to life the semi-staged production. Evocative tableaux ranging from misty forest landscapes to palaces plunged the spectator into the heart of the drama. Kathak and Bharatanatyam dancers led by choreographer Aakash Odedra gave an electrifying energy and vibrancy to the space. This celebration, brimming with passion created an all-encompassing, immersive, sensory experience, to which the audience responded with a standing ovation.